How would you like a delicious meal that was fast to make and tastes great? This fast and easy Lemon Garlic Shrimp is one recipe you’ll want to keep in your recipe box and pull out often. It’s easily adaptable to chicken if you are not a fan of shrimp or don’t have access. Oh and it is of course a gluten free recipe. This recipe was inspired by a great meal I had at Bar Pintxo, a Spanish tapas restaurant in Santa Monica. Chef David makes an amazing dish that I order every time we go there to eat. He uses prawns and of course cooks them perfectly. I have no idea what his recipe is but this is a way to sample some of these flavors. Maybe some time he’ll let me in on some of his secrets or you’ll have an opportunity to sample his dish yourself. To keep this fast and easy to cook all you’ll need to do is wash and dry your shrimp. You can peel it as you eat it. If you want to take a little more prep time you can peel the shrimp but leave the tails on. 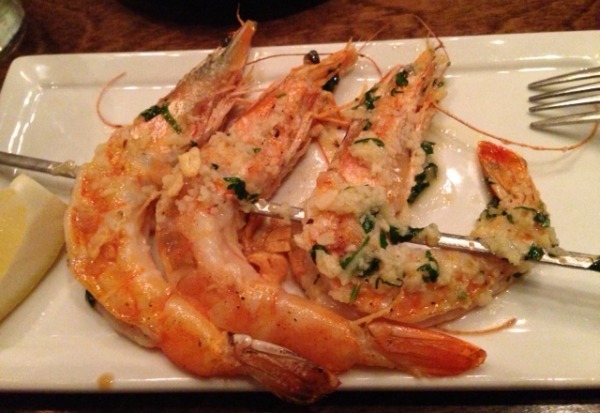 If you’re serving a really fancy meal and you can get your hands on prawns you can serve them like they do at Bar Pintxo. One more dish that will help you live an easy, healthy, gluten free life! Add in the shrimp, parsley and lemon zest. Give the shrimp a toss after a few minutes until combined. 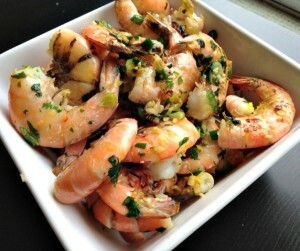 Remove to serving dish when the shrimp are cooked and squeeze the lemon on top. tip: If the shrimp curl up and look like the letter C they are over cooked. Remove them before this. This dish is great served with a large salad with mixed greens and vegetables. For an added touch you can toss in some toasted sliced almonds. I still drool over those shrimp sliders, but this looks like a snap, thanks Diane! Tessa you can tell I'm a huge fan of shrimp. Always looking for ways to serve it and often fast! Enjoy. I make this at least once a week and often use coconut oil. Also great with basil and GF pasta when using OO. Mom you reminded me in our call yesterday I was sitting on this recipe and since it's so easy, other busy folks like us would enjoy it. For those reading my blog, take note from my mother's tips here and if you have kids get them into the kitchen early too. They may end up like me, cooking and teaching others for a living and loving it. Thank you Mom!